Whether you are going to have a barbeque party or just mingling at a holiday cocktail party, you may find shrimp on the menu. If you check the statistics, you will know that Americans are in love with shrimp and eat it more than any other type of seafood. They enjoy shrimp in casseroles, sushi, soups and sandwiches. It is true that shrimp is popular, but the question is: is it healthy? Many people think shrimp is not good because it may be contaminated with viruses, bacteria, and heavy metals. So, what is the truth? Let's find out now! Yes, it is, unless of course you are allergic to it. Statistics show that 3% of adults are allergic to shrimp, and if you do not fall into that category, you can certainly eat shrimp and enjoy its many health benefits. Shrimp is high in minerals, so you can always include it in your diet. Yes, there are certain negatives associated with shrimp, but its benefits outweigh all those concern associated with it. Is shrimp healthy? Yes, it is, and one reason is that it contains fewer calories. In fact, you only get 7 calories from a medium shrimp. If you eat a dozen, you will still be getting less than 85 calories, which are less than what you get from a 3-ounce serving of chicken breast. A jumbo shrimp, however, contains about 14 calories, and a teaspoon of cocktail sauce added to it will take total calories to 19. Still, If you eat three jump shrimp with cocktail sauce, you would only be getting 60 calories, which are 20 less than a couple of mini empanadas or one pig in a blanket. While shrimp provides you with fewer calories, it provides you with loads of protein. A 3-ounce serving of broiled or baked shrimp provides you with 20g of protein, which is about the same you get from the same serving of chicken breast. Jump shrimp contains 3g of protein with almost no carbs and fat. Along with protein, there are many other nutrients found in shrimp. A 4-ounce serving of steamed shrimp provides you with 100% of your recommended daily intake of selenium, 50% of your RDI of phosphorus, and about 75% of your RDI of vitamin B12. The same serving provides you with 30% of your RDI of copper, choline, and iodine. Interestingly, shrimp also provides you with two types of antioxidants – selenium and astaxanthin. Selenium works great to eliminate free radicals from your body and protect cell membranes and DNA from damage. Astaxanthin, on the other hand, helps reduce inflammation and keep you healthy. Is shrimp healthy? Yes, it is, especially for your skin. Shrimp can actually be considered anti-aging food mainly because it contains a carotenoid called astaxanthin that protects your skin from premature aging. It also contains omega-3 fatty acids that serve as antioxidants and prevent oxidative damage to your skin cells. 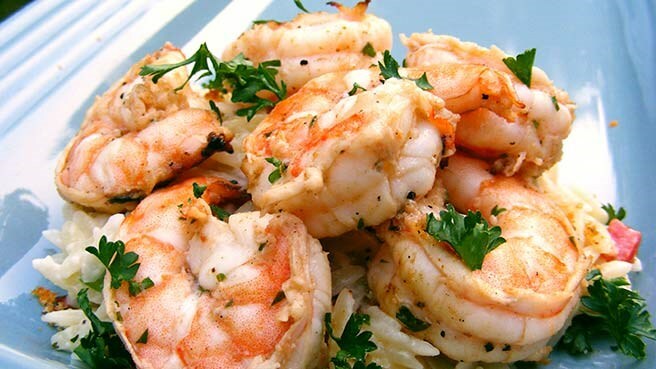 Zinc in shrimp is responsible for producing new skin and hair cells that enhance your beauty. By keeping those oil-secreting glands on the scalp functioning properly, shrimp keeps your hair healthy. The presence of copper is another reason why shrimp can help prevent hair loss and give you thicker hair. If you have diabetes, you can still find a way to include shrimp in your diet. When you have diabetes, high sugar levels can affect the membranes in your body. Shrimp contains nutrients that help repair that damage. Each serving of shrimp provides you with fewer calories and carbs, so you can include it in your diabetic diet without affecting your blood sugar levels. There certainly are several health benefits associated with shrimp, but you need to bear in mind that there can be some concerns as well. One major concern is that shrimp may be contaminated with preservatives. 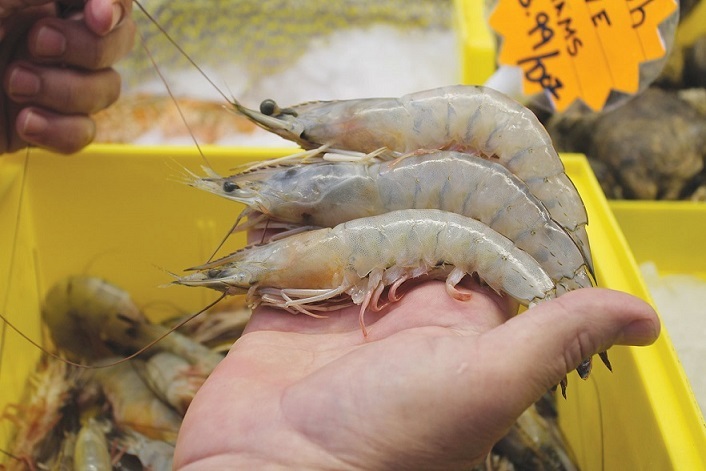 A common preservative used to treat shrimp is called 4-hexylresorcinol – it helps protect shrimp from bacteria but it can be harmful for you, especially when more than 260mg/kg is used, which happens rarely. The concentrations of this preservative in edible shrimp are usually up to 1.31mg/kg, which should not pose any health concern. Another issue associated with shrimp is that it may be infected. White spot syndrome is an infection that can kill shrimp quickly. While this viral infection is dangerous for shrimp, there is no evidence that eating shrimp infected with this virus has any effect on humans. Another valid concern is that shrimp may be contaminated with arsenic. It is important to note though that seafood usually contains arsenobetaine, which is not dangerous for humans. Is shrimp healthy? Shrimp is certainly nutritious and offers several benefits, but you have to be careful when buying shrimp. The best thing is to get it from your local seafood supplier. You will be better off opting for trap-caught wild shrimp because it has better sustainability. Ensure that you buy shrimp that has no black spots on its shell. Do not buy it if you feel it is a bit slimy and smell like the sea. Avoid it if there is any ammonia odor. It usually indicates the shrimp is not fresh. In case you are buying frozen shrimp, ensure you do not store it for longer than a month. When buying frozen shrimp, you should ensure that it says "IQF" or "Individually Quick-Frozen". Always opt for the one that says "wild-caught in U.S.A". How Many Almonds Per Day?